1. 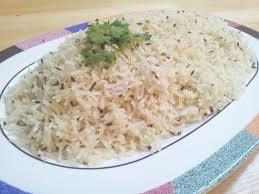 Rinse Rice with water until water runs clear � Add 2 cups water and soak for 15 minutes. 2. In a pot with a tight fitting lid, heat Oil and Ghee. 3. Add Cinnamon, Cloves, Elaichi and Kala Jeera � allow them to sputter. 4. Add Carrots and Green Peas and mix well. 5. Add Rice, Water and Salt. 6. Bring to a boil � uncovered. 7. Cover the pot, reduce flame to low and let rice simmer for 15 minutes. 8. Remove cover and stir gently to mix the vegetables and rice. 9. Turn off heat and replace cover until ready to eat. Once the pot is covered, don�t keep opening the lid to check on the rice. It will be perfect in 15 minutes without any intervention.